Datchet Keeps Racing Through the Dry Months….!! Datchet has kept their racing programme going through the dry months. As you can see in the photo, Londoners have glugged their way through pretty much a third of the water supply – yes, Datchet is a third of what they have! The racing has continued and we’ve had good fun in the series. The water is on its way back up now after all this rain we had. Mike Firth has been working with Club Management this week to reposition the keelboat pontoon. It still needs another 2-3 metres before we can take it back to the normal slipway position, but for the next phase we have it positioned on the north beach – see photos below. I hope you’re all coming for the Winter Series – visitors welcome as always! Datchet FF Training and Coaching Day…..!! You don’t have to get an RYA Coach to run coaching day for you!! At Datchet the local Fleet Heroes, John Hanson and Helen Selden, ran a superb coaching day for the home fleet. The format was simple – kick off in the Commodore’s Room gathering everybody’s interests and requirements, then outside but onshore in the morning and afloat with video in the afternoon. Plus everyone had a lot of fun and escaped the Royal Wedding !! Story and photos by Trevor Sparrow…. Datchet Bear “DW” had decided not to go to Royal Wedding because one of the guardsmen was wearing his auntie Pauline as a hat. So he went to the Flying Fifteen training day to see what happens. It was a hot windless day, just like every training day. DW met the people who sail the Flying Fifteens. They are very nice people. to the beach where two Flying Fifteens had been rigged while still on their trailers. One had the new jib and the other had the old style jib. By moving the boats around relative to the wind direction it was possible to walk around the boat and see the impact of small tweaks on the shape of the sails. DW was interested to see how small changes in the outhaul can have a big impact on the shape of the slot between the jib and the main. Then everybody went and discussed what they had learned. The next session was on the water. Boats were filmed from a rib as they performed various tasks such as tacking. In the feedback session afterwards it was possible to talk through the good and bad points of what people had done. DW noticed that people liked to bump into Mervyn’s boat . So what did DW think of the training day? He liked it because it was friendly, with everyone wanting to help each other. He learned lots of things to try and make his boat go faster. He thinks it would be a grand day out for any flying fifteen sailors, whether novice or skillful, to improve on their sailing. They should watch out for the next one. Here are some pictures of the flying fifteen sailors, say hello when you see them…especially if you would like to sail a flying fifteen. Datchet Open Next Weekend (NoR and SI Attached) ….!! Sept 9/10 !! There will be a competitors briefing at 1130 hrs on Saturday. The water is low at this time so we are asking the members to be at the club early and launch the boats before the briefing weather permitting. A Quiet Day Across the UK …. Probably….!! Forgive us for swilling tea and packing for home by 11am this morning…. Lets Go to the Datchet Open….!! Will you be joining the others and use the Datchet open meeting as the last practice event before the nationals? 9th to 10th September. We will be arranging a social evening on the Saturday evening. If you are looking for accommodation please let John Hanson know and we will try to arrange a bed with a Datchet club member. The Datchet Open is Coming Up – September 9th and 10th….!! Despite weather challenges and several of the normal touring suspects waiting on new boats, the first UK Flying Fifteen open meeting of the year was a great success, with visitors from Parkstone, Chew Valley, Hayling Island and Dun Laoghaire coming to Datchet. Racing on Saturday was abandoned due to a complete lack of wind which brought the benefit of time for our Irish visitors to watch the 6-Nations rugby – and made it easy for the English travellers to decide to come for the day on Sunday. A huge thank you to all our visitors for travelling vast distances and/ or setting very early alarms, and to the race team for their excellent management of the day. The Mercedes Open racing for today has been cancelled due to lack of wind. Datchet Winter Warm Up !!! Warm up – and blow your trumpet – at Datchet!! Happy new year – hopefully you had a good break and are ready to get sailing again. The Datchet Winter Warm Up starts next weekend (every Sunday in February), and boats have already started to appear, so it’s time to ‘de-winterise’ your boat by reversing Chris Turner’s instructions in the last FF World. The Datchet Winter Season…. !! I have at last managed to upload the Notices of Race for the MidWinter Champs (FF Midwinter 2016 NoR) and the Mercedes Trophy (Mercedes Trophy 2016 NoR) to the new Datchet Water SC website. This year we have decided to make the competition for the Winter Champs the four February Sundays of the DWSC Winter Warm Up to avoid the impact of one day’s bad weather – which seems to have plagued us in recent years. Hopefully this works for more people than it doesn’t! The SI’s for this will be the same as those for the Winter Warm Up which will be published in due course. The Mercedes Trophy is back to its normal slot of the weekend after the Dinghy Show (12th and 13th March) – timed to give you all the chance to have a bit of a thrash on flat water before the Inland Champs. The Sailing Instructions for the Mercedes are also available online (Mercedes Trophy 2016 SI’s). Grey skies and a lively breeze greeted 15 FF crews at Datchet on Saturday morning. Race officer, Philip Tinsley (Datchet’s Commodore) indicated the Sunday forecast was uninviting, and proposed 4 races on Saturday – “just in case”. He set a windward/leeward course, to ensure the shifty gusts did not ruin the reaches to a gybe mark. The first race was very keenly contested, setting the tone for the rest of the day. Last year’s winners, Richard Lovering and Matt Alvarado from HISC, winning from Chew’s Ian Cadwallader and Parkstone’s Dave Tabb. The second race saw some fantastic comebacks, with Dave Tabb and Chewey Sherrell, storming back from 7th after the first lap, to win handsomely from Lovering/Alvarado to were also buried in the pack. The race officer shortened the last two races to 2 laps, as the wind strength peaked at 29 knots. The third race saw Alan Bax and Mark Darling return to form, chasing home the in form Lovering/ Alvarado, with Crispin Read Wilson and Steve Brown third. The last race saw Simon Kneller and Dave Lucas win, from Tabb/ Sherrell and inevitably Lovering/ Alvarado. Sunday dawned wet, but not too blustery, but the forecast was dire – 35 knots gusting 55, and after a general conflab, there were no objections to cancelling further racing. For those de-rigging to go home, or on to Bewl, the wind rose and rose, ensuring the reservoir was closed by 10.30. Overall, Lovering/ Alvarado won by 2 points from the consistent Tabb/Sherrell and Kneller/ Lucas. Top Datchet boat was father and son Ian and James (Ballotelli!) Linder. Thanks to all the visitors for making the journey, even with the forecast, and to the race team for managing to complete 4 races in pretty challenging circumstances. Terrific Forecast for the Mercedes Open at Datchet …!! The Met Office is forecasting a fresh force 4-5 this weekend which will be great for Flying Fifteen sailing. There is significant interest in the event so we will be asking contestants to move their cars away from the launch area, after they have unhitched, to make space for all the boats. Sunday morning greeted the club sailors with a 12-15 knot ENE and an icy chill in the air so it was a hardy fleet which put to the water. At least thankfully for the crews the threatened rain held off. The course was set with a castle end start. Once over the start line the tactics saw the lead boats making a course behind the pier towards the windward mark. From there it’s was a steady reach with kites around the gybe mark and back to the leeward mark. As with the previous weeks a well-planned course was apparent making for some fast laps. Brett Dingwall and Jonathan Clark (confusingly borrowing Charles’s 3957 sails!) from John Hanson & Helen Hepworth (3954) who were just edging out Dominick and David Hume in (3559) with Stephen Hopson & Robert Simmons 4029, holding off Mike Clapp and Trevor Brant (3427) and Mervyn Wright and George Caspall (3904), nursing a broken kicker. On the final lap the boats were spread out just a little further with the main battle taking place for 4th and 5th. The pace remained fast with the last lap the quickest of the three. The race finished in the same order as had been held throughout. With Brett and Jonathan (3957) taking the win from John & Helen (3954) who after a race long tussle just pipped the Humes (3559) for second place. 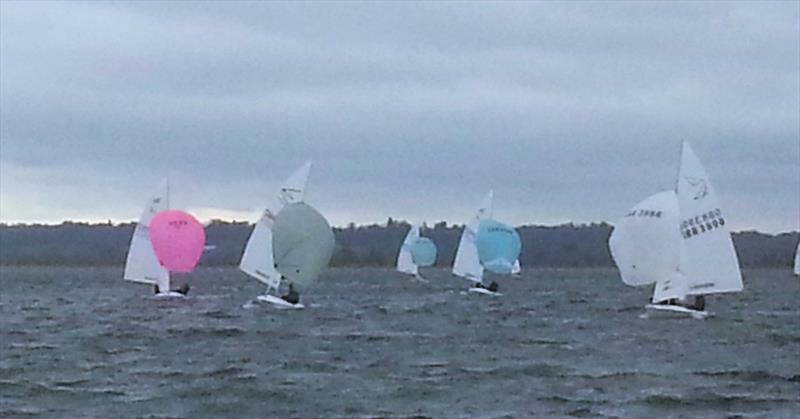 The cloud cover remained 100% but the rain still held off and the wind just dipped a knot or two for the second race. This time around the racing was even more clinical with Mervyn and George pushing the front three all the way round. The final leg saw some fast steady racing with the boats finishing in the following order 3957, 3954, 3559, 3904, 4029 and 3427 with four minutes between first and last. Charles and his various crews currently lead the series from John and Helen leaving one race left of the winter series to decide the final positions. The event is running a couple of weeks later than last year and we have already had entries from Parkstone and Chew. It would be great to see all the “Fifteen FF’s” in the current series along with visitor entries on the start line a week on Saturday! So please dust off the covers and get that final series result and practice in before the main event. Datchet Race Report, Sunday 8th March…!! After the weather imposed break and Dinghy Show duties of the previous week it was a welcome return to both Sunday morning racing and warmer weather! A solid fleet of nine FF’s put out to the water along with the rest of the club fleet, guests and the CAT Spitfire series. With Simon Kneller and Dave Lucas (4024) returning to the club and Mike Firth and Phil Tinsley back in Firths Folly (3888) a tight race was anticipated. A firm but not too cold westerly was blowing in across the lake. With a prompt start from the Club end, the FF’s divided into two groups each proposing “they” knew the quickest way to the Windward mark with several boats working a starboard tack towards the wall with the rest heading out towards the middle. The mark was rounded in close procession with Charles Apthorp and Adrian Simpson (3957), Simon and Dave, Mervyn and George (3904) and John and Helen (3954) the front runners. The wing mark was set to give a close reach (at least to stay upwind of a tower) up to the gybe mark which saw the Kites raised in a way more akin to asymmetrical fleet! The wind died for the front runners, collapsing the fleet at the gybe mark but with front positions having been held steady some fierce racing was played out for the middle and rear positions. As with the reach, the race team had carefully positioned a tower dead centre of the beat between the mark and the start leaving some tactical decisions for the crews to make. The run was fairly true downwind giving a split of the fleet to port or starboard. The final leg was completed in similar fashion to the first with a few gusts picking up in patches. Another tight beat to the leeward mark with the Kite poles close on the Halyard meant for two fast legs to the finish with 3957 pipping 3954 and 4024 with not more than a boat length between them and the rest of the fleet not far behind. The second race proved to be even closer than the first with all the boats finishing within four minutes this turned into one of the closest of the series and saw some thrilling racing however at the start this didn’t seem the way it was going to go! Two or three boats had to tack to avoid an early start forcing them to go round before crossing the line. This didn’t split the fleet too much however and a slight shift and increase in wind brought the crew bottoms someway out over the side as they headed up to the mark. This time all the boats finding a good breeze in the centre or over towards the wall. Again the race around the mark saw judgement pay off for Charles and Adrian (3957) racing tightly with Simon and Dave (4024). Charles and Adrian took the win ahead of Simon and Dave with an increased length of half a boat between the two! The Merc Open is at the end of the month 28th / 29th March it would be great to see the “Fifteen FF’s” in the current series along with visitor entries on the start line and see if we can push the field well beyond last year’s 18 boats. So with warmer temperatures and two weeks left of the winter series, now is the time to uncover the boats and get the practice in..! !